OK, what’s the big deal with Pinterest? It’s just another social media platform that you don’t have time for. So what if it’s the third most popular social site in the U.S.? Who cares that the average user spends 77 minutes on the site? Not me. But there is something about Pinterest that I care about VERY MUCH. And you should, too, if you have a website, blog or landing page. Pinterest drives more referral traffic than Google Plus, YouTube and LinkedIn combined. Pinterest drives more traffic than either Bing or Yahoo. In fact, Pinterest is the fourth-largest referral website in the world. Now those are statistics you cannot afford to ignore. And that is why I use Pinterest. Recipes — That’s right, your real estate blog can (and should) include some categories that have nothing to do with real estate. It opens your blog up to a wider audience (past clients who are not currently interested in buying or selling) and also humanizes YOU. You are a real estate agent in Denver, repinning a great photo of last week’s Bronco game. In the pin description (you should always create your own unique keyword-rich description for every pin and repin) you might say, “Love this photo of Peyton Manning throwing to Welker for a touchdown. To read my review of the game, please go to http://…..” (the link going to a blog post you wrote about the game). You are a real estate agent in Miami, pinning a photo from a third-party site of a local historical home. In the description, you might say, “Coral Gables is known for its historical homes and gorgeous architecture, like seen in this historical Spanish-style home. For more information on Coral Gables architecture styles, please visit http://…” (the link going to a page on your website or blog that is about Coral Gables architecture). 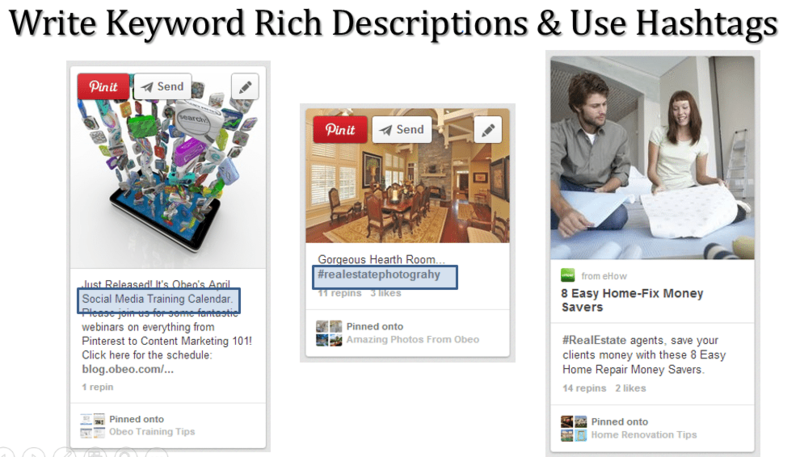 Write keyword-rich descriptions & use #hashtags. Pinterest has a very powerful and useful search engine. 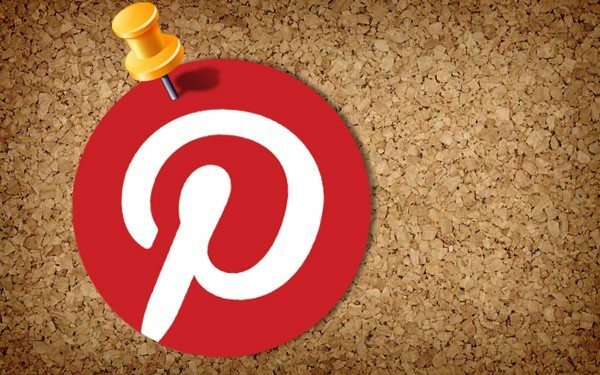 When you search a topic on Pinterest, you will receive three types of results: pins, boards and pinners. 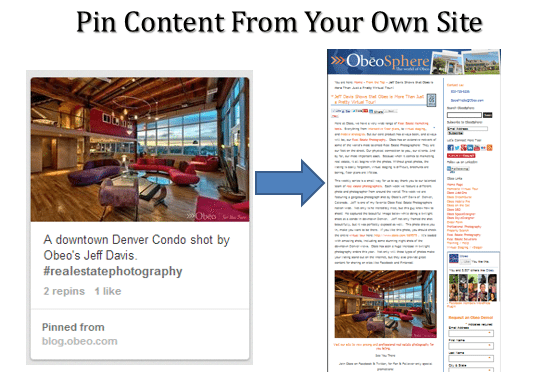 That means there a multiple ways for your content to be found if it is properly optimized for search. Give your profile a keyword-rich description. Give every board a unique keyword-loaded name, a keyword-rich description and an appropriate category. Give very pin a keyword-rich description. Even repins! And don’t be afraid to use one or two #hashtags in the pin as well. Pin content that is popular or trending. This technique will work best when combined with everything above. Popular and trending topics get a lot of attention, a lot of click-throughs, and a lot of repins. So how do you pin trending or popular content? There are many ways to do it, but here a couple examples for you. Recently, the flooding in Colorado has been a big trending topic. If you were a real estate agent in Boulder, you might start pinning flood photos from various third-party sites. In the description of those pins, you should share a link to a blog post you wrote with information/resources for flood victims. Are you a movie buff? Start a category on your blog for movie reviews. Write reviews for popular movies, and then pin content about the movie, always including a link to your review. I hope you will find these tips and tricks useful for driving traffic to your website and blog. Please follow me on Pinterest here.